Constellation Sagittarius the Archer, is an ecliptic constellation laying between constellation Scorpio and constellation Capricorn. It spans nearly 30 degrees longitude in the zodiac sign Capricorn. 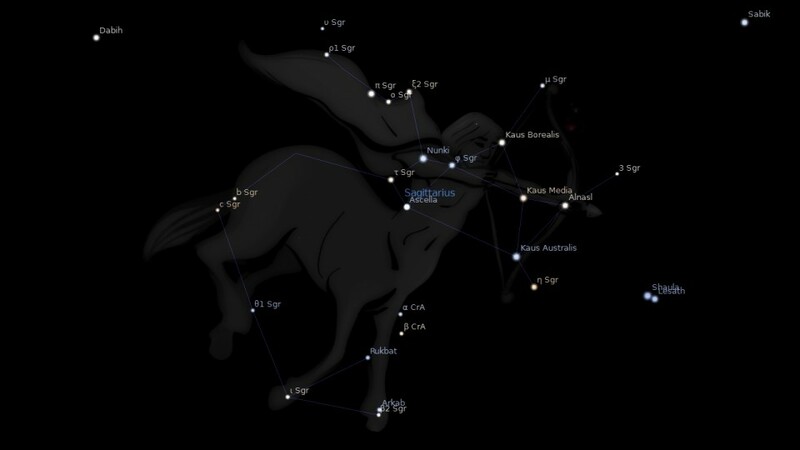 The Sagittarius constellation contains 15 named fixed stars. The formation of this constellation on the Euphrates undoubtedly preceded that of the larger figure, the Centaur Chiron (the constellation Centaurus); but the first recorded classic figuring was in Eratosthenes’ description of it as a Satyr, probably derived from the characteristics of the original Centaur, Hea-bani (Heabani), and it so appeared on the more recent Farnese globe. But Manilius mentioned it, as in our modern style, mixtus equo, and with threatening look, very different from the mild aspect of the educated Chiron, the Centaur of the South (Centaurus); while it sometimes is given in later manuscripts and maps with flowing robes; but his crown (the constellation Corona Australis) always appears near his fore feet, and his arrow is always aimed at the Scorpion’s heart. Dupuis said that it was shown in Egypt as an Ibis or Swan; but the Denderah zodiac has the customary Archer with the face of a lion added, so making it bifaced. Kircher gave its title from the Copts as IIemaere, Statio amoenitatis. As for the Archer, when the foremost portion of his cloak rises, he will give birth to hearts renowned in war and will conduct the conqueror, celebrating great triumphs in the sight of all, to his country’s citadels. Such a one will build high walls (moenia from Latin murus) one moment and pull them down the next. But if Fortune favours them too generously with success, the mark of her envy is to be seen on their faces, for she works cruel havoc upon their features. So was it that a dread warrior* paid for his victories at the Trebia, Cannae, and the Lake, even before the hour of his retreat, with such disfigurement. 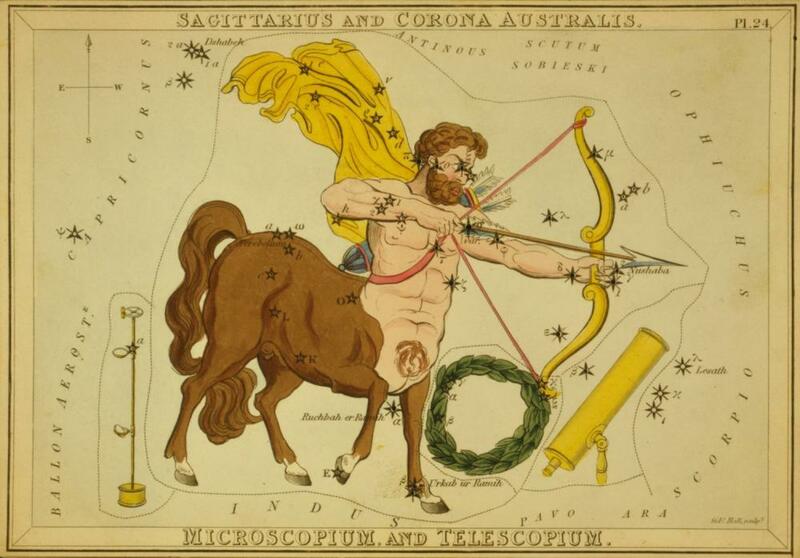 This is the concluding chapter of the first great book of this Heavenly Revelation; and it is occupied wholly with the triumph of the Coming One, who is represented as going forth “conquering and to conquer.”…This is precisely what is foreshadowed in the star-pictured sign now called by the modern Latin name Sagittarius, which means the Archer. The Hebrew and Syriac name of the sign is Kesith, which means the Archer (as in Genesis 21:20). The Arabic name is Al Kaus, the arrow. In Coptic it is Pimacre, the graciousness, or beauty of the coming forth. In Greek it is Toxotes, the archer, and in Latin Sagittarius. 1. Fixed Stars and Constellations in Astrology, Vivian E. Robson, 1923, p.60. 3. Astronomica, Manilius, 1st century AD, book 4, p.241. 4. The Witness of the Stars, E. W. Bullinger, 12. Sagittarius (the Archer).